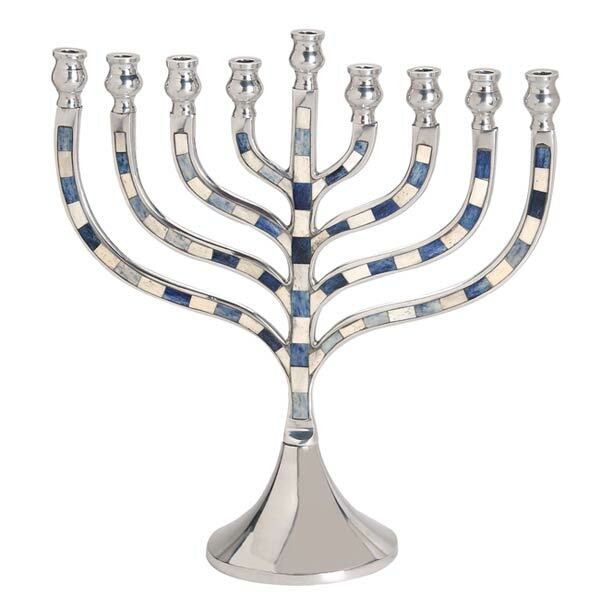 This graceful Menorah is the latest addition to our fine collection, a candle Menorah that literally has it all. A simple traditional body with some fine curves to bring it closer to today’s user. The color in the Menorah is formed by precisely carved stones (real ones) that are set into channels which run thru the entire body. And this got size, yes it stands a pretty 13” tall with branches wide enough to accommodate not only Candles but even the prefilled oil cups. This Menorah sits well, the body weight is about 2lbs. and made of solid aluminum which will sure last for a life time and pass down from Generation to Generation. Browse thru our menorah categories and find more choices of this style in different sizes and color option.